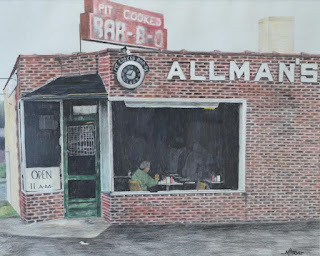 In 1954 "Pappy" Allman opened Allman's Bar-B-Q in Fredericksburg, VA. 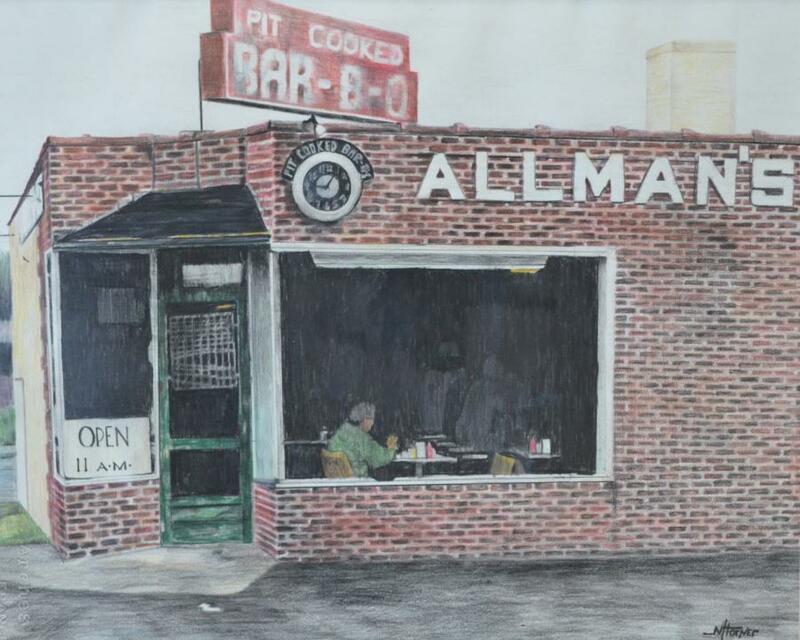 In a short time, Allman's Bar-B-Q became one of the three legendary food destinations in the town. The other two destinations were Carl's "Ice Cream" Stand (Carl's actually serves a delicious frozen confection that looks and tastes like ice cream but can't legally be called ice cream), and "the Pool Room" which made the most delectable chili dogs in the history of the world. 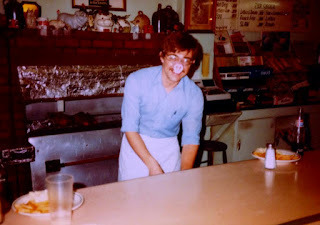 By the time I was hired to work at Allman's in 1977 while a sophomore in high school, Pappy's son in law, Pete White (Mr. White is what I called him), was the owner and was running the business. I wasn't hired to cook. My role was to clean, keep the drink coolers stocked (in those days Allman's only served soft drinks in bottles including the old bottled six ounce Coca-Colas), take phone orders and serve customers sitting at the counter. I was also responsible for wrapping all of the take out sandwiches and applying sauce on them and only on a few occasions did I ever actually make barbecue sandwiches for customers. Even so, I watched, listened, and learned several lessons about what people loved about visiting Allman's until I resigned in 1981 because of the demands of college. The barbecue at Allman's was whole pork shoulder. Every night at about 8:30 PM (except Tuesday nights because Allman's was closed on Wednesdays back then) a delivery truck straight from the meat packers would deliver about 35 to 40 whole fresh pork shoulders. On occasion I would assist in loading up the cooker. The shoulders would come four in a box. We would remove them from the boxes and place them directly in the cooker fat side down. There was no trimming or seasoning of the meat at all. Once the cooker was loaded up, the shoulders would cook at about 225 degrees Fahrenheit until opening time at 11 AM the next morning. We had an employee, Fred Ross, whose only job was to come in every night and baby sit the cooker. It was common to have a line of people waiting to get into the restaurant before it opened at 11 AM on weekdays and Saturdays and 1 PM on Sundays. By lunch time the little building was buzzing with activity. Mr. White would be chatting with customers sitting at the counter while manning the sandwich making station behind the center of the counter. 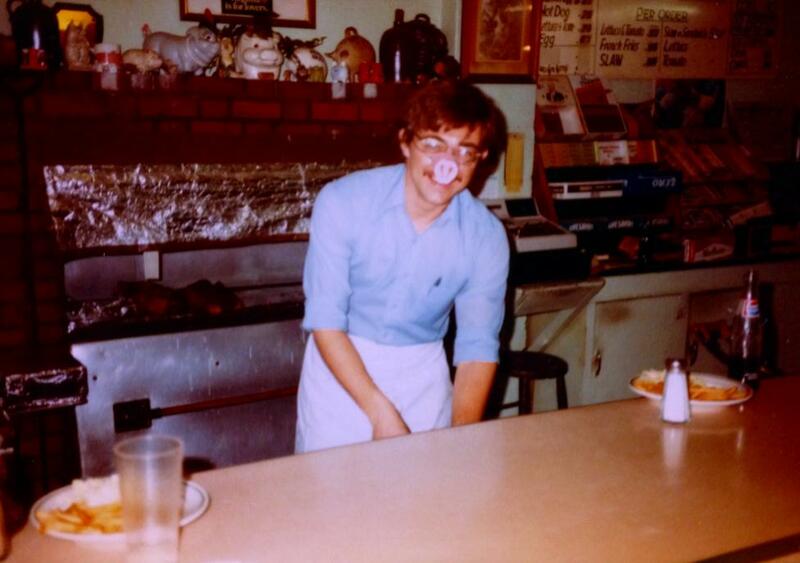 As the wait staff took orders from customers filling the tables, Mr. White would be pulling warm, juicy, tender pork barbecue from the shoulders, filling fresh hamburger buns with it and heating it in a "griddle press." That's what I called it anyway. It was an electric device with a hot griddle on the bottom and another on top. The bottom bun halves with meat on them would be placed on the griddle along with the top half of the buns beside them and the handle on the top griddle would be pulled down and the meat and bread was gently pressed between both hot griddles like they were in a clothes press or a vice. The device was about 18" square. Once the meat and bread was hot, Mr. White would put the top bun halves on the sandwiches and he would press it down again. That's why Allman's barbecue sandwiches always had a flat surface on the top bun. The bread wasn't smashed, but the part that touched the griddles did have a flat surface. Allman's also offered chopped pork. However, we never called it chopped. We called it minced. The scraps of meat that were left over from a shoulder that were too small to put on a pulled pork sandwich and the "outside" meat, that's what the bark was called at Allman's, that was too hard for a pulled pork sandwich were chopped and served on minced barbecue sandwiches. But, there were also some regular customers who specifically requested outside meat on their pulled pork sandwiches. And, by the way, the pulled pork sandwiches were referred to as sliced pork. This is because even though the meat was pulled, Mr. White used a sharp butcher knife to slice the large chunks of pulled pork into pieces that would easily fit on a bun. In the days that I worked at Allman's, we didn't serve ribs and there was no one there we called "mom" as they claim nowadays. The whole "mom" thing is a fiction created after the restaurant was sold by Mr. White. The person they now refer to as "mom" was the kitchen cook. She never cooked barbecue or made barbecue sandwiches. She also didn't cook the sauce. Mrs. White mixed the spices while the late Hazel Jordan came in on Wednesdays to cook the sauce. Hazel only knew the wet ingredients and no one but Mr. & Mrs. White knew all the ingredients in the sauce. Also, Fred Ross came in around 9pm to watch to cooker. Mary (Mom) never did. He stayed all night until Mr. White arrived early in the morning. Mary cooked burgers (she cooked a delicious cheeseburger), fries, made the slaw, hot dogs, etc. She would sometimes cook up some very tasty liver and onions but that was just for the staff and not served to customers. The only barbecue served was pork shoulder either on a sandwich or about 3/4 of a pound of it on a plate with fries, slaw, and a roll which was listed on the menu as the barbecue "Plate." The "Deluxe" was a barbecue sandwich (sliced or minced) with fries and slaw. The sandwiches were served without any seasonings or sauce. Seasoning and sauce was up to the customer. Cole slaw was optional and Mr. White would put it on the sandwich at the customer's request for an extra .05 cents. Even though the meat wasn't seasoned, I can tell you that it was still delicious. It's amazing how delicious all natural slow cooked pork tastes. The fact that it was so fresh and served without being cooled and reheated made all the difference in flavor. My favorite way to eat the sandwiches was with pulled pork, slaw, Texas Pete and Allman's barbecue sauce. Speaking of Allman's barbecue sauce, it was made in house. There was one employee (Hazel Jordan) whose only job was to make the sauce. She knew the liquid ingredients and Mr. White would mix up the dry ingredients. She would come in on Wednesdays, when the restaurant was closed, to make it. It was vinegar based with a little tomato. It was sweet and spicy. I have seen several customers ask for a glass of ice just so they could fill it with the sauce and drink the stuff. I'm serious, I saw that happen on several occasions. I also had customers who ordered milkshakes made with vanilla ice cream and the barbecue sauce. And, Allman's barbecue sauce is no North Carolina sauce either. It can only be called what it is: Old Virginia barbecue sauce. Case in point, there was one fellow who lived in North Carolina who made frequent business trips to Fredericksburg. Mr. White discretely kept a bottle of Scott's North Carolina sauce behind the counter just for him because that's what he preferred. I remember finding the bottle of Scott's sauce one time. I pulled it out from behind the counter and asked Mr. White what it was doing there. He quickly took it from my hands and put back and told the me about the fellow he kept it for. It was a secret between him and the customer, apparently. Allman's didn't sell barbecue by the pound in those days. Mr. White didn't have enough room to expand his cooker and even though he was cooking about 700 pounds of pork a day it was still barely enough meat for a whole day's service. He refused to freeze or refrigerate meat days before it was reheated and sold. All of the meat served in those days was freshly cooked. In fact, there were many days when Mr. White would tell me to put up the closed sign at about 4 PM because we had run out of meat. We had customers from all over the country and many who would commute for hours every week to visit. 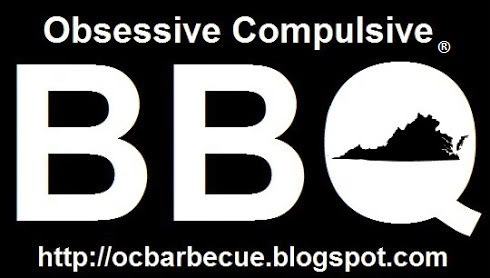 Of all the things I learned, the most important was that barbecue isn't just a cuisine. It's much more. It transcends the barriers that society has built. When I worked at Allman's I would see people from all walks of life standing in the same line in order to all eat the same barbecue. Nowadays every time I barbecue a pork shoulder I fondly reminisce about those days working at Allman's and Mr. White and the place where my barbecue obsession was born. 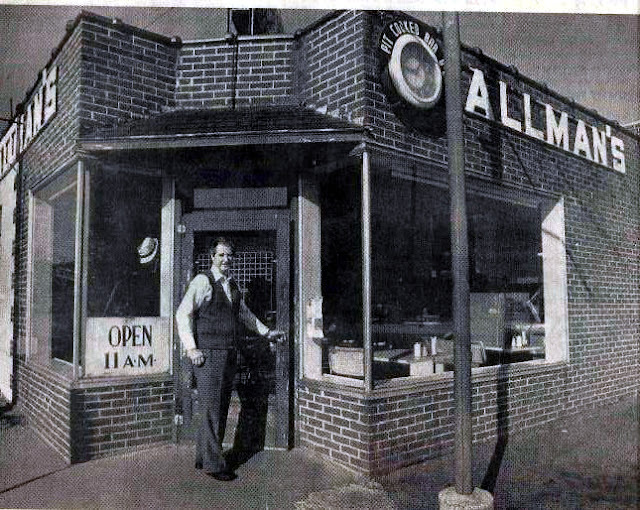 Sadly, Mr. White retired and sold Allman's in 1986 and passed away not long after. The barbecue at Allman's was never the same after it was sold. 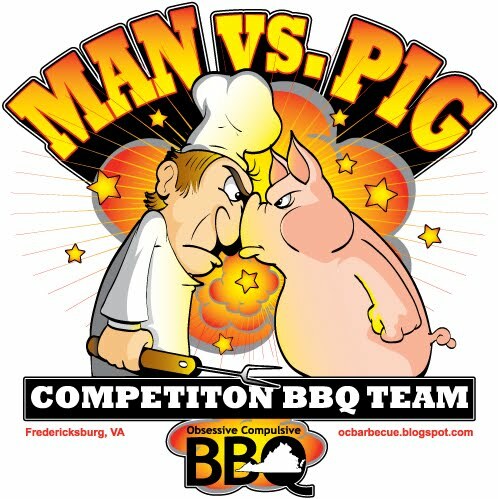 I am a Northerner and never understood what the big deal was about barbecue until I was a student at Mary Washington College and went to Allman's with friends. What an epiphany. It's true the barbecue isn't the same now, but it's still not bad. I would give anything to have the recipe for the cole slaw served when Mr. White was the owner. I asked him for the recipe several times, but of course he would never divulge it. George Bannister's Barbecued "Charles City Bacon"